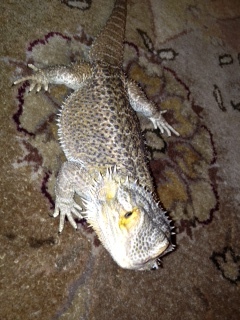 After much debate, my husband and I decided that it was time to give up Smiles, our beloved, pet bearded dragon. We brought Smiles into our family about a year and a half ago, after some exhausting pleading from our then, 10 year-old son. When we took him home in his little plastic container, like the kind you get from takeout Chinese with air holes popped in the top, he was just a baby, no bigger than a green bean. As we settled him into his new tank, finding a nice stick for him to perch on and a rock for him to laze, we fell in love. Or at least my husband and I did; unfortunately my son quickly tired of the huge responsibility of acknowledging him. What? How did that happen? Weren’t you going to “die” without him? So day in and day out, I made his little salads and picked up crickets for some crunchy protein. My husband cleaned his tank when necessary, and took him out to wander our living room. But soon it became more of a job, neither of us wanted. Making sure the children stayed alive was responsibility enough. So we decided to find a family to adopt him and I put a notice on the parent board for our community. Come on, you know you want me. I quickly received about five responses. I mean, really, who could resist that face? Apparently they didn’t realize this was an adoption. There was an interview process and papers to go over with the attorney, uh, my husband, the attorney. We didn’t raise no illiterate lizard, so clearly they were out. 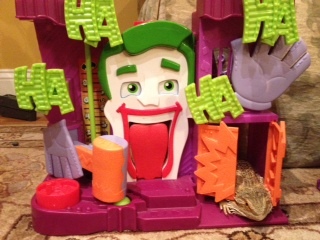 The other family asserted with strange pride that they already housed a turtle, dog, cat, hamster, fish and snake. 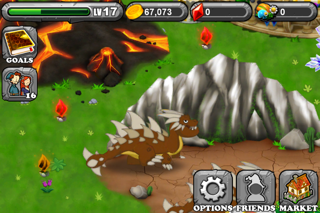 Uh, if I wanted to give him to a pet store, I would have. That left us with a nice sounding teacher with kids, and a family who wanted to give Smiles to their 10 year-old son who had been pining for one, as a birthday present. Hmm did they say a 10 year-old? We went with the teacher family because they responded first, and his email trail back and forth with his wife begging her, was extremely cute. Oh yeah, I went in for the background check. We set up a time, and as we waited for him to arrive, my husband and I skittered down memory lane with Smiles. Remember when we lost him outside in the bushes? Remember when he fell asleep next to the couch, his body flattened to the floor and we thought he was dead? 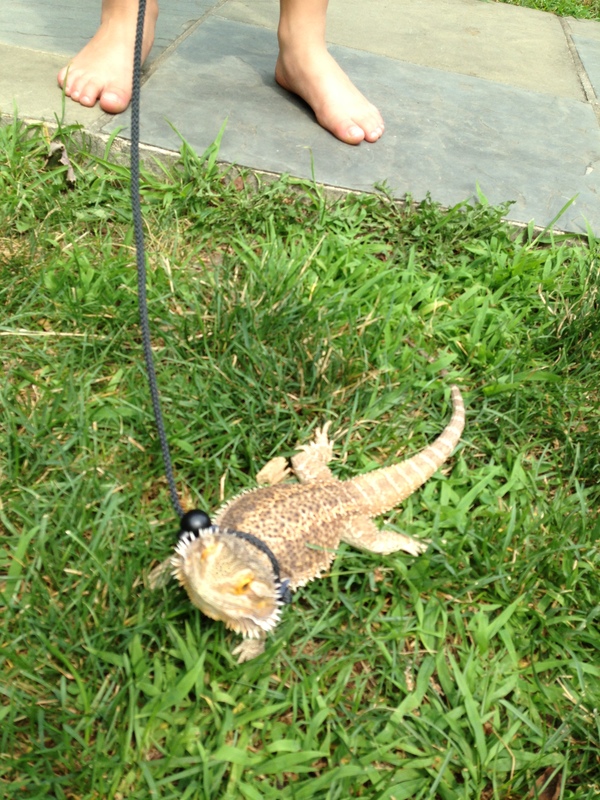 Remember when we bought that little leash and tried walking him? Stop it. No you stop. No, you. Oh good times. So many smiles, Smiles. When the teacher arrived to take him away, I saw by the alpha stance of my husband, chest out, dragon hanging, that he was ready to give him the third degree. The man stuttered and backpedaled and in the end, my husband deemed him unfit for adoption, and he cowered off empty handed. 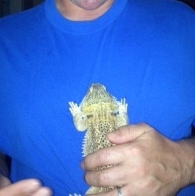 You don’t mess with a man and his lizard. No surprise, we’re still looking for the ‘right’ family. Did I mention he rocks at hide and seek? 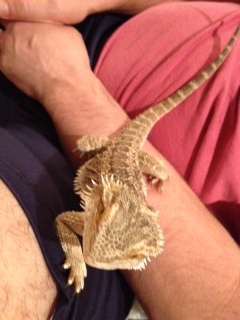 Posted in Every Day Scoops and tagged bearded dragons, children caring for pets, giving away family pet. Bookmark the permalink.